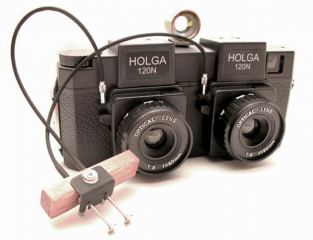 Randy Smith, who has made a career adapting toy cameras, made this customized Holga. He took two standard Holgas, a diamond tipped bandsaw, and a whole bunch of creativity to make this modified beauty, which is capable of creating 3D photos. The lenses are placed almost the same distance apart as human eyes, so the camera records the same object from two slightly different angles. There are two ways to view these 3D photographs – either by crossing your eyes, or by way of an animated gif. Taking photos like these was extremely popular in the early 20th century, and the tradition has continued into present day with toy cameras like the Viewmaster. Randy Smith builds these cameras to order; pricing starts at around $250.